Are you interested in helping a club become stronger? If a club has 12 members or fewer, it is eligible to have a club coach. You aim is coaching a club to get stronger, get more members and get organised an help its members achieve their goals. You can see that this can be a very fulfilling role to take. If you become a coach, you will be helping the club and developing your own skills. In addition you will also be completing one of the key requirements for the Advanced Leader Silver award. For the Silver award to you need to be either a club sponsor, mentor, or club coach. Here are three resources that will be of use. 1. Getting appointed – your Area Director can submit this form to the District Club Growth Director for approval. 2. Check out more about the role, and how you can be successful. 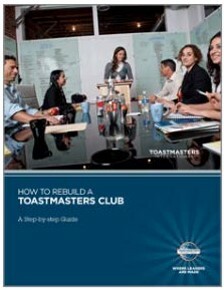 Rebuild a Club manual. 3. Look up the materials on How to be a First Class Club Coach.